Music Genre - You guessed it...easy rock. It was American Thanksgiving last week and I’m going to assume plenty of sweet potatoes were served in one form or another. I find a lot of people don’t like sweet potatoes but that may be because they’ve never had them chimichanga style. I made this dish the other night while I was traveling the radio dial. I originally landed on a classical station but I skipped it. For those of you that follow this blog you'll realize that I broke my own rules but I just couldn’t bring myself to make something called chimichanga to classical music. It would have been a musical cooking train wreck. I ended up on an easy rock station 97.3 FM and I stuck around because they were playing some upbeat tunes from the 80s’. Bowie’s “China Girl” and Prince’s “1999”…fun tunes to cook to especially because I know all the words and can sing along. The station also played some real classics that made me laugh because they are just too funny (in a nostalgic way). Song’s like…Donna Summer’s “Last Dance” and Toto’s “Rosanna”. Apparantly Toto still tours...who knew? I always wondered why a rock band would call themselves after a dog in the wizard of Oz. Getting back to the cooking, if you decide to make these chimichangas you can skip frying them if you wish but they won’t be nice and crispy. The alternative is to lightly spray them with cooking spray before baking them in the oven. Still good but lacking a little “chimi” and a pinch of “changa”. As for my overall cooking experience I’ll give it 3 out of 5 song notes. The music was enjoyable but a little on the easy side for these chimichangas that are full of pizzaz! Cook-on! 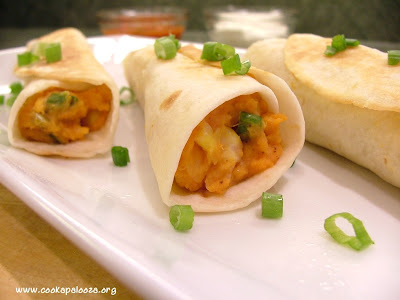 In a medium bowl, combine mashed sweet potato, salsa, sour cream and chili powder. Mix well. Stir in green chilies, corn, cheese, green onions and cilantro. Hip Cooking Tip - Use microwave power to cook the sweet potato for this recipe. Pierce the sweet potato’s skin a few times with a fork, then put in the microwave on high for 5 to 7 minutes, re-arranging once. Let the sweet potato cool slightly before removing the skin and mashing it up in a bowl. To assemble, spoon ¼ cup filling in the centre of a tortilla. Fold tortilla end, closest to yourself, over the filling just to cover. Fold the left and right side of tortilla towards the middle to enclose the filling. Fold over again, towards the top of the tortilla, to make a parcel. Repeat with remaining filling and tortillas. In a large non-stick skillet heat ½ tbsp of oil over medium-high heat. Place 4 filled tortillas, seam side down in the pan. Fry for 30 seconds to lightly brown the tortilla (they brown quickly). Turn over and fry for 30 seconds more. Remove tortillas from pan and place seam side down on a baking sheet. Repeat process with remaining oil and filled tortillas. Bake fried tortillas, uncovered in a 350º F oven for 10 minutes. To serve, top each tortilla with a dollop of sour cream, salsa and a sprinkle of the remaining green onions.